Almost 10,000 fans show up at League Park on the last Sunday of May, 1945 for the Opening Day double-header against the Memphis Red Sox. Led by Catcher-Manager Qunicy Trouppe (pictured) the Buckeyes won both games by scores of 3-1 and 6-2. Avelino Canizares hit an inside the park home run in the first game to support the pitching of brothers, George and Willie Jefferson who held the Red Sox to one run. The Buckeyes scored five runs in the first inning of the second game and pitcher Eugene Bremer only allowed two Red Sox runs in the 6th inning for a complete game win. The following Wednesday, May 30th, was the Decoration Day double-header. (Now known as Memorial Day, Decoration Day was always celebrated on May 30th) The Buckeyes trounced the Red Sox 14-2 in the first game. In the second game and down by two runs in the final inning and facing the Red Sox' All Star Pitcher, Verdel "Lefty" Mathis, Avelino Canizares singled home the tying runs from second and third with two outs to send the game into extra innings. 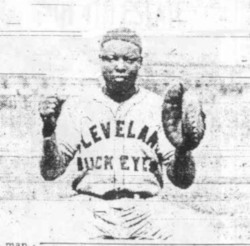 In the first extra inning, Archie Ware singled home Parnell Woods, who tripled with one out, to sweep the double-header.